It’s very common for local anesthetics to be used during dental treatments. 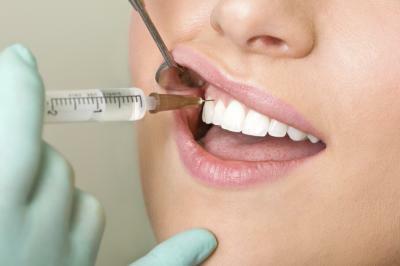 The local anesthetic may cause a little discomfort as its being administered, but it will save you from a lot of pain during whatever procedure you’re having done. It may be scary to think about getting an injection of an anesthetic, but try not to worry too much. Dental practitioners are trained to administer anesthesia and will help you to not feel overly anxious. If you’re nervous, speak with your dentist. They can help you to understand what the procedure will entail. In some cases, your dentist may use nitrous oxide or “happy gas” to help relax overly nervous and anxious patients. The gas is fast acting and the affects are short-lived. There are different types of local anesthetics. The type of local anesthetic you receive depends on the procedure or treatment you’re undergoing. Articaine has replaced the once popular and widely used novocaine. Articaine is a short-acting “local” anesthetic that doesn’t linger long after the procedure. Lidocaine is used for longer restorative work and surgical procedures. Lidocaine can affect a larger area and may take some time to wear off. For extreme cases of anxious patients, dentists may use a general anesthetic. General anesthetic is intravenous sedation which puts you into a sleeping state. As you “sleep,” the dentist will perform the procedure. You won’t feel any pain during the procedure. General anesthesia is also used for more serious and complex oral surgeries in general. If you have further questions about anesthesia or are still feeling anxious about your upcoming procedure, speak with your dentist. They can help you feel more relaxed and will walk you through your best options.